Putin’s Punim on a Pillow? Permissible? George W. Bush, our former President and current amateur portraiture artist, recently nixed attempts by the website, Society6, to sell images of his paintings of Vladimir Putin and others. 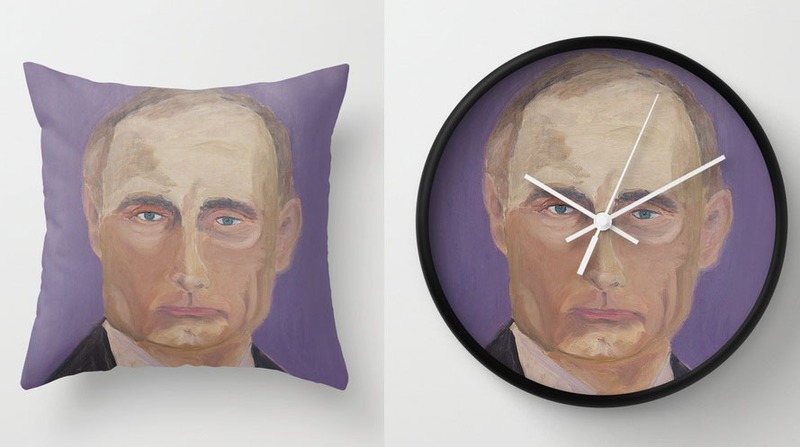 Though quickly pulled from circulation, there was a limited chance to buy W’s recently publicized images of Vladimir Putin on a pillow, Tony Blair on a wall clock, or W on a shopping bag. It wasn’t clear if permission had been obtained to exploit W’s works, but the speed with which the merchandise was pulled from public display suggests that no such permission was granted. Some have speculated that the recent seminal “Fair Use” case, Cariou v. Prince, might have allowed the seller to use those images free of copyright infringement claims. Nope! But the Putin story does provide us with an excuse to pull you into the Fair Use Doctrine in the fine art world. But to get there, we first need to talk about puppies: And we do mean some very, very cute puppies!!! In 1980, Jim Scanlon, a California resident, acquired a new litter of eight (8) adorable German Shepard puppies and he asked Art Rogers, a California professional photographer, for some portraits. The black and white photograph above, aptly named “Puppies” was the result. In 1987/88 Jeff Koons, the famous American artist and sculptor (yes, the guy who now makes balloon-like dog sculptures and is listed as one of the five  richest living artists in the world – that guy) decided to build upon Puppies, with a colorized sculpture with minor accessory changes, and the result was “String of Puppies” above. 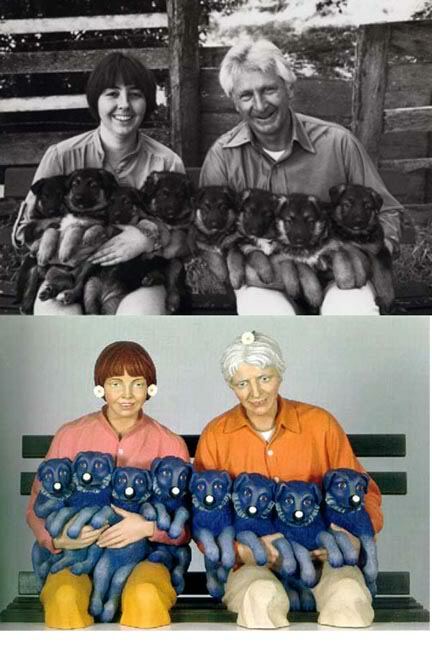 In the copyright infringement action which followed, Koons asserted, among other things, that he was permitted to freely copy “Puppies” under the Fair Use Doctrine. Now, “Fair Use” in the world of copyright can be confusing, but the doctrine provides that under the right conditions, the reach of copyright protection should be blunted for the greater good. The governing statute (17 U.S.C.§107) does not define Fair Use, but most of the time you know it when you see it. For example, Fair Use applies for purposes of teaching, scholarship, comment, news reporting and criticism. A movie review is Fair Use. Fair Use also allows for parody. So, a Saturday Night Live or Tonight Show send-up of a film or musical piece can occur without crossing copyright tripwires. What fun would life be if copyright holders could control news reports, reviews or even parodies of their works? In short, Fair Use is a necessary escape valve against copyright restrictions to encourage full and complete expression and further thought, innovation and creativity. But knowing when the Fair Use line has been crossed is pretty much a visceral thing. It’s a gut call as to when use of a copyright is “Fair” and should be sheltered from claims from the holder, or when the rights of the copyright holder have been abused. But now, jump forward to 2007. Richard Prince is a famous (and, like Koons, gi-normously wealthy) “appropriation artist.” Appropriation art is defined in Wikipedia as the “use of pre-existing objects or images with little or no transformation applied to them.” Appropriation artists should be forewarned: When your method of business involves “appropriation” of another’s work, then be prepared for copyright litigation as part of your business plan. Patrick Cariou is a photographer who, in the 1990’s spent 6 years living among Rastafarians in Jamaica. In 2000, he published a book titled “Yes Rasta” which contained numerous photos taken by Cariou of Rastafarian life. 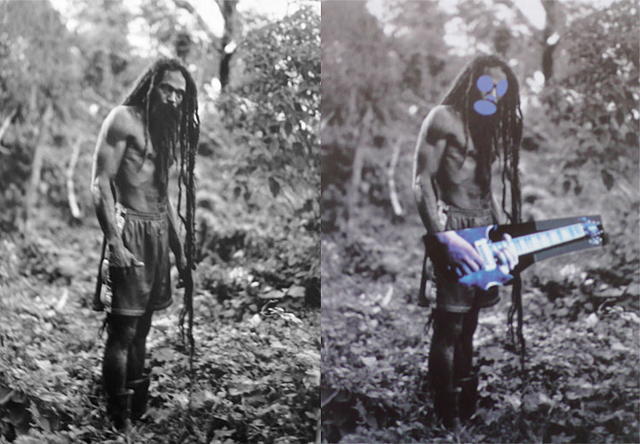 In 2007/08, Prince “appropriated” and “re-contextualized” a number of “Yes Rasta” works. In the infringement action which followed, Prince asserted that “Fair Use” allowed him free use of the Cariou’s images. While approximately 30 images created by Prince from “Yes Rasta” were under review, “Graduation Day,” pictured above, appears to have become the hallmark emblem of the case. The Prince images resulted in enormous commercial success for Prince, but none of that financial windfall flowed to Cariou. Permit this blog author one conceit: The author’s Millennial-age daughter was consulted about “Graduation Day” and her take was instructive. Millennials are a generation raised on irony, she said. So the artistic purpose in “Graduation Day” was immediately obvious to her (even if not to this author.) Further, she said, the art also occurs through the provocative discussion arising over differences between the original “Yes Rasta” and Prince’s “Graduation Day.” Or, maybe this view foreshadows a further expansion of “Fair Use” for an internet-savvy, file-sharing generation fully at ease with the likes of YouTube, Reddit or Imgur. Now, that’s heavy, man! But generational meta-physics aside, what remains clear is that taking W’s Putin and slapping it onto a clock or pillow, without more, does not infuse W’s creation with new understanding or insight. The image exists only to sell clocks and pillows. So, no “Fair Use” there. But then a Putin pillow would have been cool to own, no?